There are a lot of “bucket list” books out there—1,000 Places to See Before You Die, 1001 Foods You Must Taste Before You Die, 501 Must-Visit Natural Wonders, 501 Must-See Movies, etc. I don’t know about you, but I start to feel overwhelmed—and getting older by the second—when I peruse these tantalizing lists, knowing I won’t get to sample half of what’s on them in my lifetime. I will never forget the first time I saw them. I was working a summer job as a tour guide in Skagway, Alaska. It was the end of August, around 10 pm, and the midnight sun had given way to dark night skies. I saw a glow in the east over the peaks behind town, and I thought, “Wow, that is going to be a very bright moon rising momentarily.” But the moon never appeared. Instead, the luminous white glow expanded and took on a slightly greenish cast, and soon the skies over the mountains began to move. I realized I was seeing the northern lights for the first time. The ghostly glow swayed left, then right, undulating like a sheet in the wind. I was transfixed. I’d heard the phenomenon described as moving and mystical, and each time I’ve seen it, I’ve found words inadequate to describe what it looks like, and how I feel in response. Every northern culture has legends about the aurora. One Inuit myth holds that the northern lights are torches held in the hands of Spirits seeking the souls of those who have just died, to lead them over the abyss terminating the edge of the world. Another holds that the lights are the visible spirits of unborn children playing ball in the heavens. The scientific explanation for the lights may be less poetic, though still fascinating. 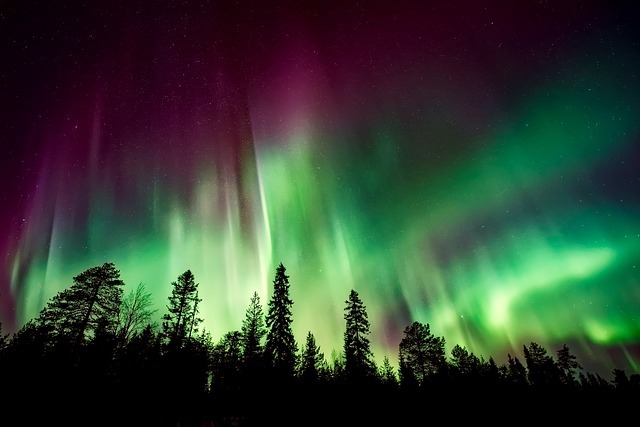 Auroras are born of the sun, when large explosions and flares throw great quantities of particles into space, carried outward by the solar wind. The aurora is an electrostatic phenomenon that occurs when these charged protons and electrons in the magnetosphere collide with atoms and gases in the Earth’s upper atmosphere. When the particles meet the Earth’s magnetic shield, they are pulled into two great ovals around the Earth’s magnetic poles. 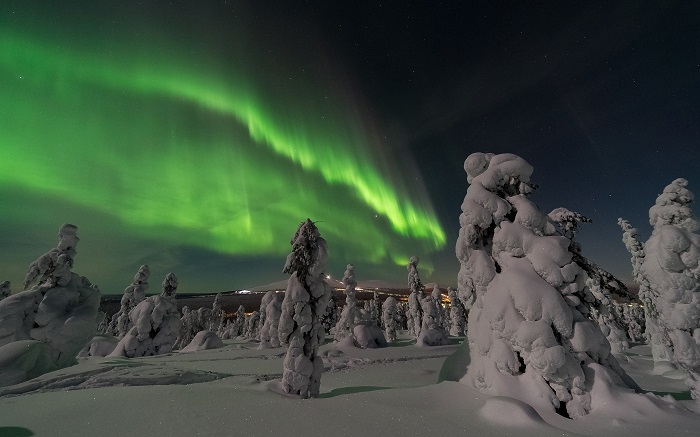 As they interact with the upper layers of the atmosphere, approximately 60 to 150 miles above our heads, the energy that is then released appears as a luminous, moving glow, typically visible in the night sky in the polar zones at particular times of the year. Each gas gives out a characteristic color when bombarded. Excited oxygen atoms emit yellow-green light, the most commonly observed color. Ionized molecular nitrogen emits blue and violet light, colors to which the human eye is less sensitive. At lower altitudes, excited molecules of nitrogen and oxygen glow with a vivid red. These three primary colors together produce the hues of a typical aurora. 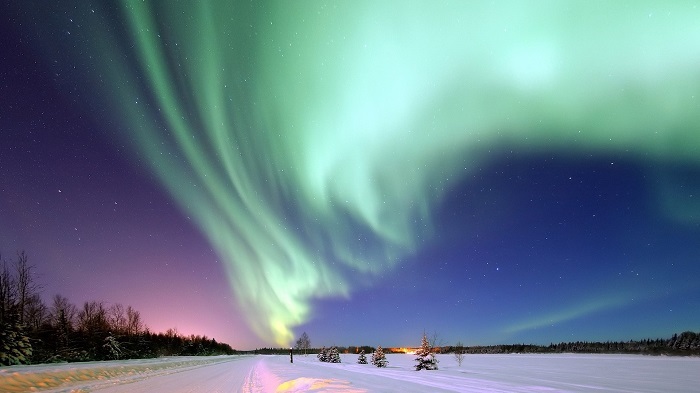 Many historical accounts of the northern lights from areas far south of its usual location exist. An early Chinese record describes it as a “red cloud spreading all over the sky.” The Roman philosopher Seneca wrote that an aurora in AD 37 tricked the emperor into sending troops to aid what he thought was the burning seaport of Ostia, “when the glowing of the sky lasted through a great part of the night, shining dimly like a vast and smoking fire.” In 1583, similar “fires in the air” mobilized thousands of French pilgrims, who prayed to avert the wrath of God. On September 15, 1839, an intense aurora dispatched firefighters throughout London. Because the north magnetic pole lies in North America, the auroral oval generally reaches farther south there. This means observers at a given latitude in North America have a better chance of seeing an aurora than those at the same latitude in Europe or Asia. Both Rome and Chicago lie at a latitude of 42°, for example, but Rome averages one aurora per decade while Chicago could see about ten each year. In general, you are more likely to see an aurora if you are at a higher latitude, that is, closer to the pole. In Europe, northern Norway generally offers the best location for seeing the lights. But the best place on the planet to maximize your chances of an auroral encounter is Churchill, Manitoba, Canada. Why not farther north? It turns out that the earth’s magnetic poles are not exactly in line with the geographic poles, so the optimal latitude for seeing the aurora is actually the magnetic latitude. Churchill—also famed for the best polar bear viewing on Earth—lies directly beneath the auroral oval in the Northern Hemisphere. With auroral activity occurring on more than 300 nights per year, Churchill offers unique access to this captivating phenomenon. The view from directly under the aurora shows dazzling bands of light with huge depth, and often with vivid color. For tips on the best strategy for viewing the aurora, visit NOAA’s Space Weather Prediction Center. The site has a map showing current auroral activity that is updated continuously. 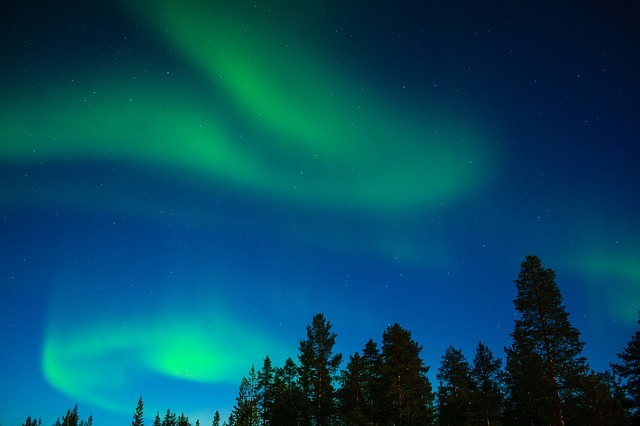 While one can never be guaranteed an auroral display at any given location or time, the odds for seeing the lights in Churchill in midwinter are so good that NHA offers a popular Northern Lights and Arctic Cultures trip each February. 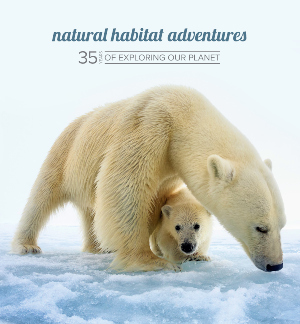 In addition to experiencing the wonder of the aurora—a highly likely prospect—this subarctic expedition offers an exciting slate of other northern adventures, including a dogsled ride over the tundra, a visit to Churchill’s renowned Itsanitaq Museum, and cultural programs featuring the arts and traditions of the Inuit and Dene peoples. When night falls, it’s time to move into heated viewing domes outside of town to await an unparalleled experience of nature’s magic: the spectacle of the legendary Northern Lights. Whether a soft green glow, shimmering pink curtains or a wavy, white coil of rays flowing overhead, you will never lose the sense of wonder that accompanies an encounter with this most amazing of nature’s phenomena.